Vitals Mobile and Disease Tester machine. the Human Vitals- Blood pressure, pulse, oxygen level, temp/fever/ optional EKG blood sugar and virus detection match. to make selections and touchscreen. The viruses are saved in VRAM to match the blood sample from the finger Prick. 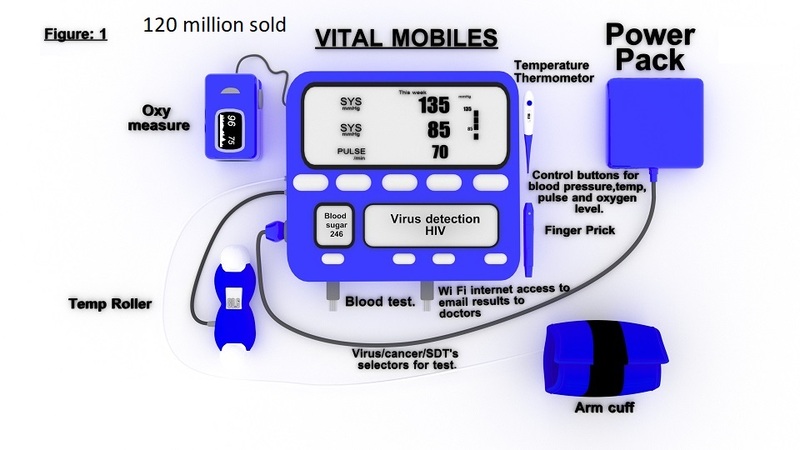 The mobile disease tester normal size has all the disease, and/or heart markers, and pregnancies. The mini one has only HIV, Herpes, syphylis, hepatits, Chlamydia, Goneria, HPV, Trichomoniasis and preganancies. The Mobile devices solves the problem of not knowing if your new Sexual partner has any STD's or is pregnant. The All in one provides a Medical Device that checks the entire health of a human person from Vitals, glucose, Viruses, cancers, Heart issues and pregnancies.